Includes (1) 16 oz. plastic Favor Cup to match your party theme. Get one especially for the birthday child or hand out as favors. 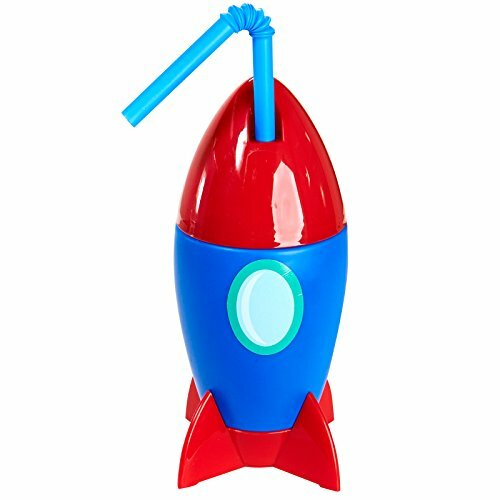 Includes 4 Space Rocketship Molded Plastic Sipper Cups with Straw. Holds approximately 16 oz. Add additional party tableware, kits, decorations, favors, games, and activities to complete your celebration and entertain your guests. Great for childrens birthday parties, kids school parties, a pizza party, sleepovers, prizes, favors, or a theme party. Perfect for your outer space, astronaut, NASA, or Miles from Tomorrowland birthday party!